Simplify your business communication with a text system built for users like you. An automated text system has it all. Send news and info to your entire opt-in list or a segment of your list in a few easy clicks. 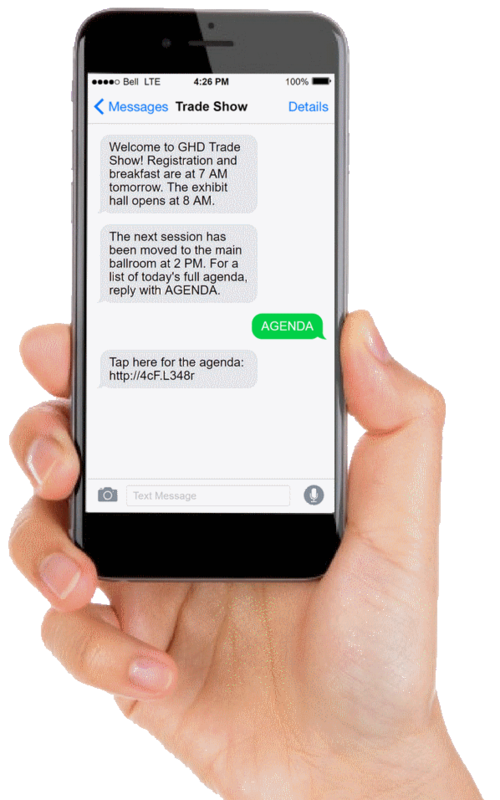 Allow your audience to access your content wherever and whenever they need by texting trigger words. Message scheduling lets you setup and send messages for your whole week or month in a single session. Message-specific widgets enable you to deliver info on demand and automatically segment your audience into distinct groups. Text alerts sent to your phone and corresponding email reports tell you how people are interacting with your system. GivBee lets you create targeted text groups and send messages based on areas of interest and other criteria. PayPal integration makes payment convenient and secure for you and your recipients. Conduct instant, text-based polls, surveys and quizzes. Then act on the results! of texts are read within 3 mins of being received. of smartphone users say they text regularly. of marketing emails go unopened. More reasons to Go With GivBee. In minutes, you can select your keyword and launch a text message campaign that will inspire your audience and get them to take action. Whether you’re sending simple push messages or need to setup an interactive experience, GivBee has the templates and toolset you need. There are many ways to market a text service and grow your opt-in list. Let us share what we know about what works and what doesn’t. Need help crafting your next campaign? Our team of Textperts can give you creative input and help you put together a winning stategy. We offer text plans to fit just about any use case and budget. Request a demo today and we’ll explain all the options. We’re happy to share texting’s best practices and a set of texting controls designed to keep things on-track. GivBee solutions are relied upon by non-profits and businesses everywhere.